The Prime Minister, Shri Narendra Modi, today called for increasing food-grain productivity from 2 tons per hectare to 3 tons per hectare. Addressing a gathering of farmers at New Delhi's Vigyan Bhawan on the occasion of the launch of DD Kisan, Doordarshan's channel dedicated exclusively to farmers, the Prime Minister also called for making the "Tehsil" the unit of agricultural planning and development. 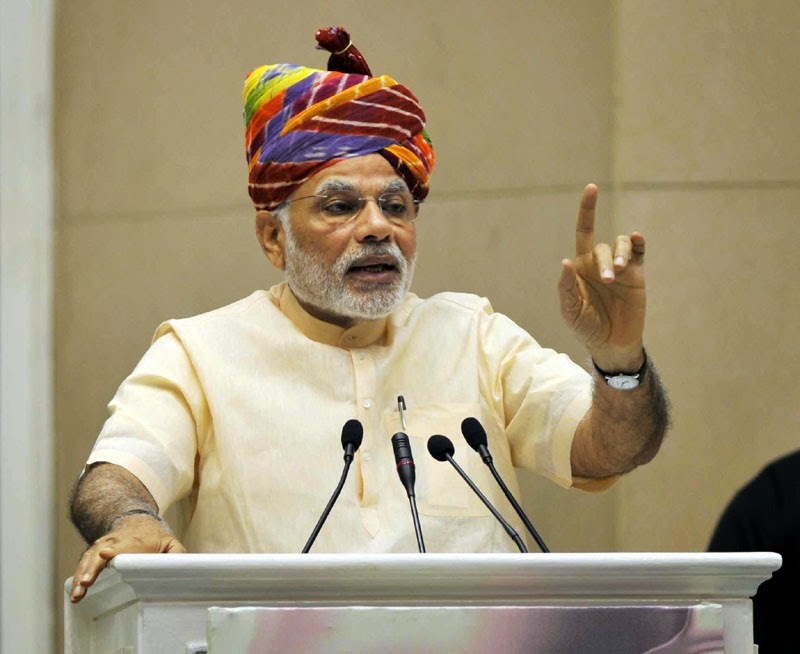 The Prime Minister said that if the country has to move forward, villages must progress, and if villages are to progress, then it is essential for agriculture to progress. He said there was a time when agriculture was the most preferred of professions, but over a period of time, its attractiveness had declined to rock bottom. He added that with the right incentives and actions, this trend could be completely reversed. The Prime Minister recalled the inspiration of former Prime Minister Shri Lal Bahadur Shastri, which had led farmers to make the country self-sufficient in the production of foodgrains. He said the same inspiration and spirit was needed again, so that the nation became self-sufficient in the production of pulses and oilseeds. The Prime Minister said the DD Kisan channel should keep an eye and inform farmers about the changes in weather, global markets etc., so that farmers can plan ahead and take the right decisions well in time. The Prime Minister called for re-engaging rural youth with agriculture in a big way. He said DD Kisan channel can also highlight the efforts of progressive farmers, so that their innovations can be replicated across the country. The Prime Minister called for farmers to adopt a three-pronged approach to agriculture, which balanced farming, animal husbandry and tree plantation. The Union Minister for Agriculture Shri Radha Mohan Singh, and the Union Minister for State for Information and Broadcasting, Shri Rajyavardhan Rathore, were present on the occasion. 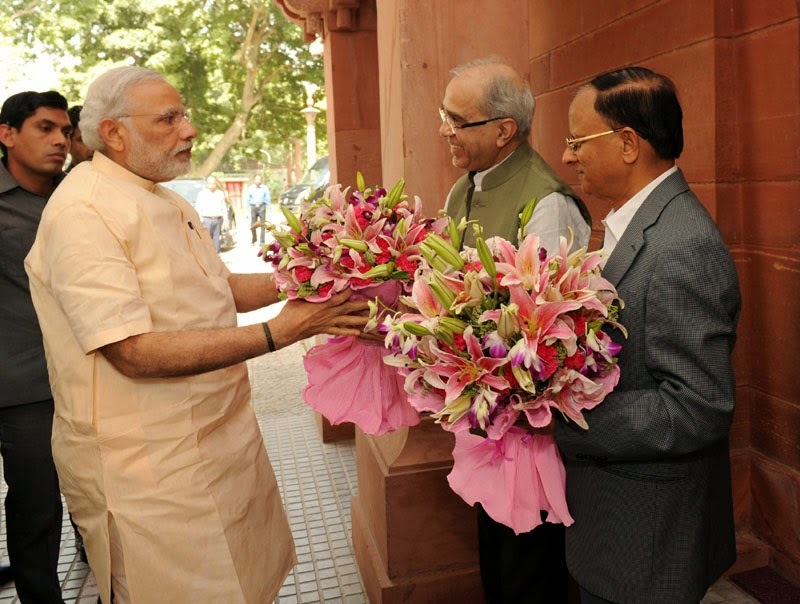 The Prime Minister, Shri Narendra Modi being greeted by the Principal Secretary, Shri Nripendra Misra and the Additional Principal Secretary, Shri P.K. Mishra, on his arrival at South Block, in New Delhi on May 26, 2015. The Prime Minister, Shri Narendra Modi, today interacted with all officers of the Prime Minister’s Office at South Block, on the occasion of the first anniversary of the his Government. The Prime Minister praised the officers, as “Team PMO,” for the hard work and dedication with which they are performing their duties. He was also given an overview of the various reforms and changes that have been initiated in PMO over the last one year, under his leadership and guidance. The Prime Minister, Shri Narendra Modi interacting with the officers of the Prime Minister’s Office, on the occasion of first anniversary of his Government, in New Delhi on May 26, 2015. The Prime Minister said that his experience had been that Government functionaries and the common man, think alike, and if given the right atmosphere, the Government machinery can deliver results for the common man. The Prime Minister was also felicitated by the officers, on the completion of one year in office. The Prime Minister was greeted on his arrival in South Block this morning, by Principal Secretary Shri Nripendra Misra, and Additional Principal Secretary Shri PK Mishra. The President of India, Shri Pranab Mukherjee has condoled the loss of lives on account of derailment of a train in Kaushambi district of Uttar Pradesh yesterday (May 25, 2015). In a message to Shri Ram Naik, the Governor of Uttar Pradesh, the President has said “I am sad to learn about the derailment of a train in Kaushambi district this afternoon, in which some persons have lost their lives and many others are injured. I understand rescue and relief operations are currently underway.